Moving from silos to synergies will create the enabling framework necessary to connect adaptation, mitigation and sustainable development. Photo © ODI / Reinaldo Coddou H.
May 2017, Berlin Germany – Building resiliency to the effects of climate change and transforming economies toward low-carbon development requires integrated, cross-cutting solutions. In this way, a new paradigm is emerging toward addressing multiple risks and delivering co-benefits across climate and non-climate drivers. This will entail connecting climate action to long-term sustainable development planning, financing and budgeting. Effectively integrating sustainable development with climate change adaption and mitigation means evolving from working in silos to working in synergy. And current national efforts to align three key processes — the SDG Agenda, Nationally Determined Contributions (NDCs), and National Adaptation Plans (NAP) formulation and implementation — can be a key lynchpin to achieving that. This was the main message emerging from a breakout discussion on 3 May in Berlin, Germany, at the Global NDC Forum. The event was organized by the Integrating Agriculture in National Adaptation Plans (NAP-Ag) and National Adaptation Plan Global Support (NAP-GSP) programmes. Co-organized by UNDP, the German Environment Ministry-hosted event brought together over 250 climate experts and policymakers from around the world to forge partnerships that can support scaling-up climate action and a prompt start to implementing the Paris Agreement on Climate Change as articulated in countries’ NDCs. Representatives from the governments of Costa Rica, Egypt, Kenya and Viet Nam were among those who gathered in Berlin. Leading small group discussions in the breakout session, they anchored the dialogue in their experiences — highlighting both initial advances and key challenges to forging more synergy and links between their respective NDCs, NAPs, and country strategies and targets for the Sustainable Development Goals. They proffered ideas on how to shift cultures from working in isolation to achieve sustainable development and climate goals to creating common approaches and leveraging global support and successes to everyone’s mutual benefit. The discussions, co-facilitated by UNDP, FAO and LEDS-LAC experts, examined key cross-cutting themes associated with meeting the challenges. How to identify win-win solutions and harness the co-benefits between adaptation, mitigation and other social development priorities. How to establish workable integrated governance arrangements and policy platforms. How to ensure that climate financing strategies holistically address long-term country needs, whilst encompassing and leveraging the full range of resource flows to drive climate-compatible sustainable development. How to engage line ministries to integrate sectoral planning effectively into these broader processes. Stephen King’Uyu, from Kenya’s Climate Change Directorate, for example, discussed how Kenya had made headway to align planning cycles to reach the goals and strategies outlined in its NAP, NDC, and national SDG action plans through a combination of both top-down and bottom-up approaches; and through collaboration with the ministry responsible for the coordination of SDG implementation. These measures include placing emphasis on climate-smart agriculture as a top entry point to build resiliency among local communities, and simultaneously ensure food security, equitable access to natural resources, green growth and poverty reduction. Through this work, the Government of Kenya has developed strategies for different agricultural crop value chains to confront climatic stresses, work that extends also across livestock and fisheries. To help realize these action plans, gender-sensitive climate budgeting is now mandated as part of planning reforms. Line ministries must comply before receiving any annual budget. Costa Rica spoke to its efforts to package climate investment plans with strong co-benefits between Greenhouse Gas mitigation and adaptation in its NDC, particularly involving forest management and bioenergy, such as sustainable coffee production and on-farm biogas. According to Pascal Girot, Advisor to the Ministry of Environment and Energy, the national metric system to monitor the climate policy is also being strengthened to incorporate better measurement and tracking of these co-benefits. 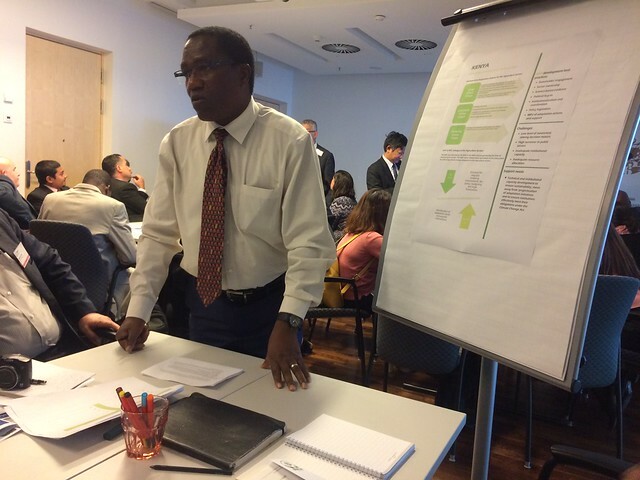 “In order to identify and make best use of adaptation/mitigation synergies, you first need data to better understand impact and benefits,” stressed Girot. The view from Egypt focused on how capacity development and governance arrangements can be mutually reinforcing and interlinked. For example, Samir Tantawi, Programme Coordinator at the Ministry of Environment, emphasized the need for common mandates for whole-of-country coordination mechanisms on climate change and the SDGs that identify common capacity gaps and implementation synergies between national SDG action plans and the NDC; this includes having detailed, costed action plans from priorities that have been generated from the NAP process. These can be powerful tools to reduce vulnerability and streamline monitoring and reporting systems at the national and international level. Finally, Ms Trinh Nguyen, from Viet Nam’s Ministry of Planning and Investment, underscored the importance of partnerships to develop simplified, more standardized and transparent tools for tracking climate finance. Viet Nam is pioneering efforts to base its NDC and adaptation strategies on clear evidence of financial gaps and the effectiveness of past budget allocations. In addition to conducting a Climate Public Expenditure and Institutional Review (CPEIR) at the national level with support from UNDP and the World Bank, it is localizing these diagnostics at the sub-national level in 17 provinces in the Mekong sub-region while simultaneously integrating green growth, adaptation, and disaster risk reduction in a streamlined and cross-cutting approach to planning. With UNDP support, the Government of Viet Nam is also attempting to get a complete picture of all climate finance flows to promote zero-carbon development. In order to achieve these goals, they are undertaking a private climate finance assessment to identify entry points to leverage more green investment to meet the SDGs and implement the national “Plan for the Implementation of the Paris Agreement Action Plan,” which was ratified by the Prime Minister last August. “It is not only crucial to raise awareness on the need to build synergies between these different planning processes, but also to provide our countries with the means to do so, including capacity building on prioritization tools and ways to ensure cross sectoral integration,” said Mr. King’Uyu. Meeting the climate change challenge is a massive undertaking requiring not only behaviour change but also reforms to how government processes and investments integrate new information on risk and benefits. As a result, it is critical that financial, human and technical resources brought to bear on the issue are used most efficiently. By streamlining systems and processes between the SDG, NDC and NAP agendas, countries can prioritize focus and reduce information silos to build greater transparency and accountability around the status of their efforts, as well as institutional capacities at various levels. In summary, bringing climate policy implementation, development planning processes, and integrated governance and finance frameworks into greater alignment can add value to all agendas. The discussions in Berlin were just the first start to efforts by UNDP and its development partners to catalyse more collaborative partnerships and more coherent methods to move countries forward. Judging by the input and enthusiasm emanating from the Forum, there is both strong appetite and need for good practice guidelines and concrete tools to deliver the benefits of such joined-up approaches.